MORE NEW SHAPES—AT YOUR REQUEST! The quilters who asked for Can Can shapes all agreed they wanted something larger than the size in the book. We listened. 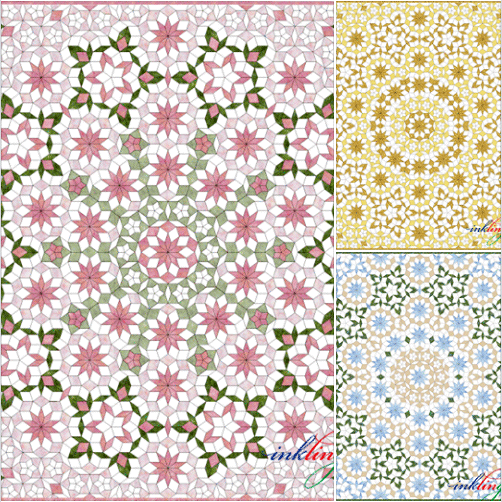 At first glance, you might think the kite in Can Can is the same as the kite for Ballet, the amazing quilt on the cover of Millefiori Quilts 2, but the shapes are different. The shapes are different and so is the size. Also, Ballet is made up of interlocking rosettes in an unsymmetrical layout whereas Can Can is symmetrical with a medallion center, so the assembly instructions are different. The diamonds in the original have 3 cm sides (1.18 inch) and these are 4 cm (1.57 inch). That is 133.333333% of the original. 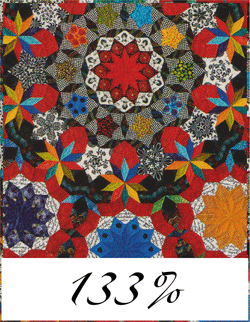 With 4 cm shapes, the quilt is approximately 63 x 74 inches without borders. As usual, the Inklingo Can Can shape collection includes layouts to print on fabric or on paper or freezer paper. Like Le Grand Désert and other Millefiori designs, there are wonderful opportunities for continuous stitching by hand and chain piecing by machine. Printing the shapes on fabric with Inklingo makes the preparation fast and precise. 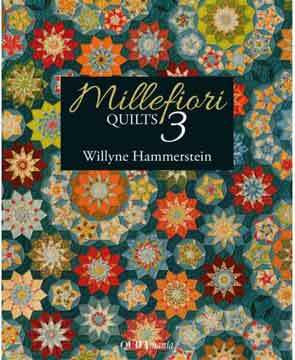 You don’t need acrylic or papers but you will need the Millefiori Quilts 3 book for the assembly instructions. Preparing Inklingo shape collections involves many steps and some are Tedious with a capital T. To make some boring steps bearable, there are times when I can re-watch (listen to) DVDs while I work. 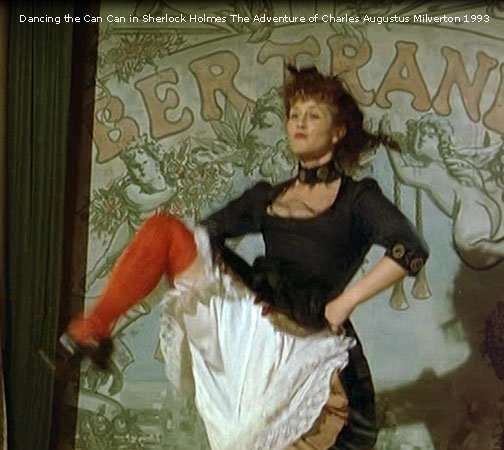 When I was working on Can Can, I happened to be “watching” Sherlock Homes (above) and suddenly—out of the blue—Can Can started to play! Serendipity! I highly recommend Jeremy Brett to keep you company while you sew. It’s fun. There is a VIDEO on the Main Millefiori Page (under the Shop tab) showing how to sew Passacaglia with a running (or dancing) stitch. It also applies to Can Can and the other quilts. Willyne teaches hand piecing with a running stitch. Sewing with a running stitch is fast and easy when you print the shapes on fabric with your Inkjet. It makes the preparation faster AND more precise than with any other method. Many quilters tell me that they are not confident about combining many fabrics and many colors, so I have been sharing variations of Can Can on Facebook which use fewer colors. It’s a good starting point and a great way to build your skills. You Can Can Can. Inklingo is all about making quilting more accessible. Even if you don’t feel confident choosing dozens of colors, YOU can still make Willyne’s amazing designs. If the scrappy look featured in this beautiful book is not quite what you are looking for, Willyne’s instructions work with just 3-5 colors. 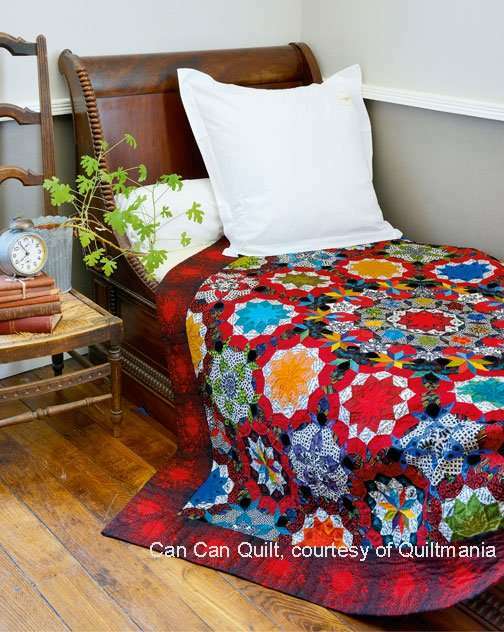 I don’t have the stash or a place to display a bright, scrappy design like Can Can but I still want to dance a Can Can, inspired by Millefiori Quilts 3. If Can Can makes you want to kick up your heels (music) all you need is a computer (Windows or Mac), Adobe Reader (free), and an Inkjet printer—and the book, of course. How cool is that! The more I work with Willyne’s designs, the more I admire them. 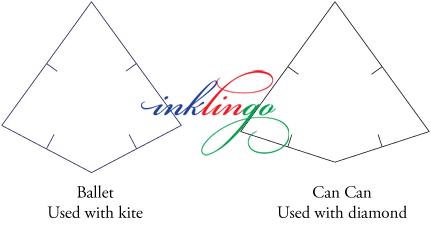 Thank you to all of the quilters who requested Inklingo shapes for Can Can. You—and Willyne—keep me inspired. Thank you for visiting. Let’s dance!